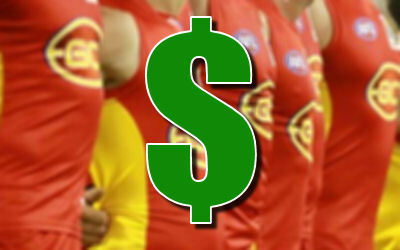 Gary Ablett leads the Gold Coast Suns list for the prices. Nathan Bock could be a popular option if he’s ready for round one at his price. Obviously Gary Ablett ($621,200) comes in as the most expensive Sun due to his average last year and he’s worth every cent. Look for some value up on the Gold Coast in Nathan Bock ($135,900) who has been heavily discounted and available as a FWD. The number 5 draft pick Kade Kolodashnij ($252,000) is one of the better fantasy players out of the current draft crop, but is the midfielder going to cost us too much to start with him? I was a little disappointed that Nathan Bock lost his DPP and is only a forward. Bock is a lock at that price if he has a full preseason we need as many basement bottom mature types as possible with these inflated starting prices. David Swallow might be handy with DPP hopefully he can go up from averaging 70 odd up to 80-85 like what McKenzie/Harbrow did last season. McKenzie is a no from me though he stuffed me up come crunch time last season when all the premo defenders were getting injured, he stopped kicking it to himself from kick ins and generally played a deeper role limiting his scoring when I needed him to score. David Swallow a DPP that is interesting and he could have break out this season. He won’t get tagged because of the talented onballers on the list. Spot on, we need more DPPs or defenders/forwards with good scoring capabilities etc like finding next seasons Hibberd or Stokes, hopefully there will be a few of them.